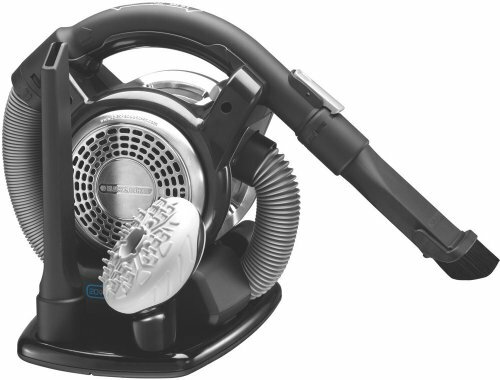 The Black & Decker Platinum BDH2000FL 20-Volt Max Lithium Ion Flex Vacuum has a high performance motor that is combined with a cyclone action. Together, these features create a long lasting and strong suction. It is portable and cordless so you can quickly grab it and go anywhere in the house. The included pet hair tool easily and quickly removes that hard to get rid of fur from floors, stairs, and furniture. A bag less, translucent dirt canister lets you see just how much is being picked up. It’s easily dumped with a touch of a button. Once charged, the long life Lithium technology will hold its charge for up to 18 months. 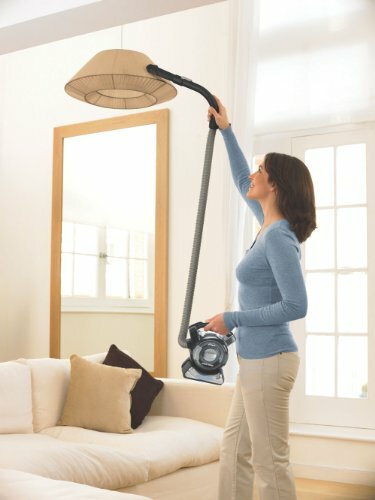 As an Energy Star approved product, this vacuum only charges when the battery needs it. There is no battery memory involved. This means the battery will have a long lifespan. It comes with a storage caddy for the accessories. This, along with the charging base, allows the vacuum to be neatly stored when not in use. Ultra compact, portable, and cordless means you’ll be able to handle all your household chores without having to pull out the full size vacuum. While using it, the refresh knob for the filter will let you flick any debris that clings to the filter off of it. This can improve the already strong suction power. Dust and debris won’t escape due to the three stage filtration system that this vacuum utilizes. The Black & Decker Platinum BDH2000FL 20-Volt Max Lithium Ion Flex Vacuum is versatile and will keep a strong suction twice as long as similar vacuums will. While in use, the innovative four foot long flexible hose lets the operator get into those hard to reach areas around the home. After vacuuming, the hose can be wrapped around the main unit so that it can be neatly stored away. It can rest on the charging base so that it is ready to go the next time it is needed. There is a pet hair tool, a two in one brush, and a crevice tool to help with difficult tasks. Its lightweight design and flexible four foot hose can reach up to the hard to get corners over head as well as thoroughly clean stairs and corners down below. The electronics provide the long lasting suction. Three layers of filtration and the cyclone action ensure a good cleaning. The filter can be placed in the dishwasher safely to be cleaned. Also easy to care for, it only takes a touch of a button to dump out the bowl where the dirt and debris collects. The Black & Decker Platinum BDH2000FL 20-Volt Max Lithium Ion Vacuum is excellent for all your big messes in the home or car, especially in hard to reach areas. The four foot hose allows the operator access to places full size vacuums can’t get into. It also works very well on stairs and overhead spots. When you’re finished vacuuming, the hose winds around the machine, and it stores neatly away. This is the ideal vacuum for any job where you don’t want the hassle of bringing out the full size vacuum. It is easily maintained as it can rest on the charging base between uses. The transparent debris container only takes a push of a button to be emptied. Because you can see into it, you won’t forget and allow it to become clogged. The filter is simply placed in the dishwasher when in need of cleaning. It comes out good as new and ready to go. Some have complained that it is noisy, but this doesn’t seem to be an issue when compared to how well it cleans. Replacement batteries are hard to find, but this battery has a long lifespan so replacements are seldom needed.